Rendered nearly invisible by her painful shyness, Anna is the middle girl of three sisters living with their mother in a rambling Victorian home. At seven years old, terrified by the impending threat of school, she retreats into passageways and secret rooms of her own construction, and lives within the walls of her home for the next seven and a half years. Anna is content to hide away as a sort of household ghost, nearly forgotten by even her family, until her own growth as a woman renders her “invisibility” no longer possible. A stray love note pushed through the walls of her refuge appeals to her developing emotions, and the time approaches for Anna to once more venture into the outside world. I randomly spotted The Woman in the Wall on Kakaner’s bookshelf at some point around when we first began exchanging reading material on a regular basis, and the premise deeply appealed to me since I’m a. sorta shy and b. obsessed with secret nooks and passageways, to the point that a home-within-a-home sounds right up my alley. Even outside of my particular quirks, the concept is an emotionally powerful and imaginatively appealing one. Unfortunately, Kindl’s writing isn’t up to the task. Although the book aims for a wistful, playful mix of Gothic fairy tale and magical realism, it increasingly dissolves into a weepy, unconvincing pastiche, with the narration lurching between “artsy,” “quirky” whimsy and banal adolescent histrionics. Too much pretension (or, more charitably, ambition), not enough substance. 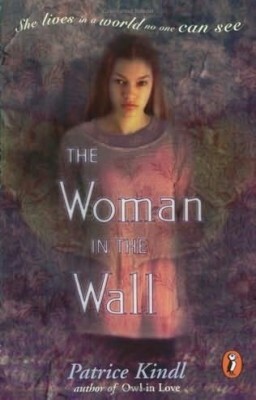 Though Anna’s story could have been a moving modern fairy tale about escapism and self-isolation, The Woman in the Wall more often seems clumsy, superficial, and implausible. For some reason, I was mildly obsessed with this book as a child. I have no idea where I got it from, but I think I’ve read it at least 3 or 4 times. The premise (as you said too) appealed to me IMMENSELy, but each time I read it it failed to fulfill what I was looking for. I kept picking it up again hoping it would magically transform into something more amazing. I’ve just never seen a cover model with her features. And yeah, the cover has a little too much Photoshoppe for my tastes, but the model is lovely. I just read this, 1 of my kids brought it home. I will always regret the time I spent reading this garbage (thankfully, it didn’t take very long). I’m all for imaginative fantasy, but this story was all over a very potholed road. So implausable, 1 night a 7 yr old is single-handedly remodeling part of a house and 2 days later she falls unnoticed into a womans purse and is carried outside? Huh? Aside from the inane story line, the narration sounds rather 1883ish. Oh, I almost forgot, the girl dissappears and isn’t seen by her family for years, yet they do nothing to try to find her. An odd disturbing book I don’t want my kids (or anyone else’s to waste their time on- they’re better off reading the backs of cereal boxes).